The Mueller investigation into Donald Tump’s possible collusion with Russia has officially been delivered to the Attorney General, but somehow Trump doesn’t seem phased by the situation. 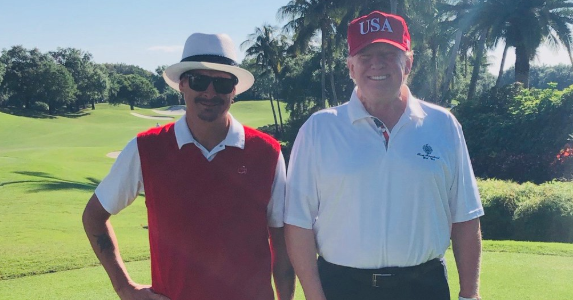 After spending Friday night “bathed in golden light” with Melania and Barron at Mar-a-Largo, the Big Boy In Chief apparently caught up with his pal Kid Rock for a few rounds of golf at the resort on Saturday afternoon. Kid Rock took a moment to commemorate the president’s astounding indifference on Twitter, where he thanked Trump for the invitation. See Kid Rock’s latest Trump tweet below.